A thought came to me today as I was trudging through the woods: What is the oldest recorded Benchmark? Most of what I have seen has been from the 1950's or later (some from the 30's). I know of one in Poke County that was set in 1899, and the oldest benchmark in North Carolina is was set in 1849. I sure that in the U.S. there are older marks. Thanks for the question. I have recovered a 1909 Primative travel station bench mark # 4. USC&GS TRINGULATION station Fortune 1961 near Stamped "FORTUNE 1961",near BM 1526, 1923, as witnessed by Mr. Patton the Brass monument is in the old garden and in good shape with one plow mark across it! Wasn't George Washington a surveyor? I wonder if anyone has ever found anything that he put in the ground. I was also wondering about that tree where Daniel Boone was supposed to have carved "Dan'l Boone kilt a bar here". If anyone ever found that, there's probably a McDonalds there now. The question of what is the oldest benchmark is yet another one with no definite answer, since benchmarks have been set for literally thousands of years. Extensive surveying occured in this country long before the nation was formed. The Coast Survey, ancestor of the NGS, was created in 1807, but no work was done until 1816, when Ferninand Hassler, an immigrant from Switzerland, where he had been a highly respected surveyor, began a limited amount of work on Long Island. So technically the first point, from which the nationwide control network eventually sprang, was probably set there at that time. It is highly doubtful that any of the earliest points survived for long, and they may not have even been intended to be permanent. Work on a comprehensive network along the entire coast did not take place until the 1830s. Some of the markers set at that time may survive, but I am not specifically aware of any. Anyone who would like to read about the details of the early work and see a gallery of early photos can visit www.history.noaa.gov. Thanks for the feedback. I live near Historic Fredericksburg, VA (Ferry Farm, George Washington's boyhood home, is just around the corner), so maybe I will be lucky enough to stumble across one of those "oldies". Once, two marriages ago, we were traveling the Sky Line drive in the Shenandoah. There is a pullover, and next to this pullover is two large boulders, one larger than the other. Or maybe they are outcroppings, it's been 20+ years. Anyway, on top of the largest portion is a benchmark. Before I could really read the date, and it was old, my loving family began to scream "BEAR!!!" Not being the kind to say, "Where?!?" I almost ran the thirty feet to the ground the short way and was in the car before I realized they were now laughing at me. Oh well, no bear. But I'm sure the benchmark is still there. A friend and I found one today that dates originally to 1859...in the middle of nowhere, in water, to boot. What a lot of fun! "Why worry when you can obsess?" Wow, thanks for the note. This town contains at least 1/4 of my ancestry since my grandmother grew up in Newbury and all of her ancestry is from Newbury or one of the neighboring towns. The mention of the first English settlers is fasinating, even if a bit off since the town was first settled in 1635. If you are interested, here is a bit about the original settlement of Newbury, Mass. It's amazing to think they used this same hill 367 years ago. Recovered KV5818 yesterday and it dates from 1876. I assume the underground marker is still intact based on the description and the current good condition of the 1935 surface monument. Hey thanks, Jeremy, I'll enjoy looking through those! I'm afraid I have no choice but to sell you all for medical experiments. It is a lighthouse on an island off the coast of Massachusetts north of Boston, first observed in 1834. Congratulations to bfabry for logging a find for it! In an earlier message I guessed that the oldest true NGS point still in existence was probably from the 1830s, so I imagine the ones listed here from that decade are legit and one of them is probably the oldest survivor. I was curious about the six older ones mentioned and took a look at their data sheets. The ones in California, Ohio and Minnesota are clearly bogus and the date 1800 appears to be either an error or somebody's idea of a joke. The other three are important historic points, but they are boundary points, appropriated rather than created by NGS. The one in Maryland set in 1765 was apparently first used by NGS in 1961. 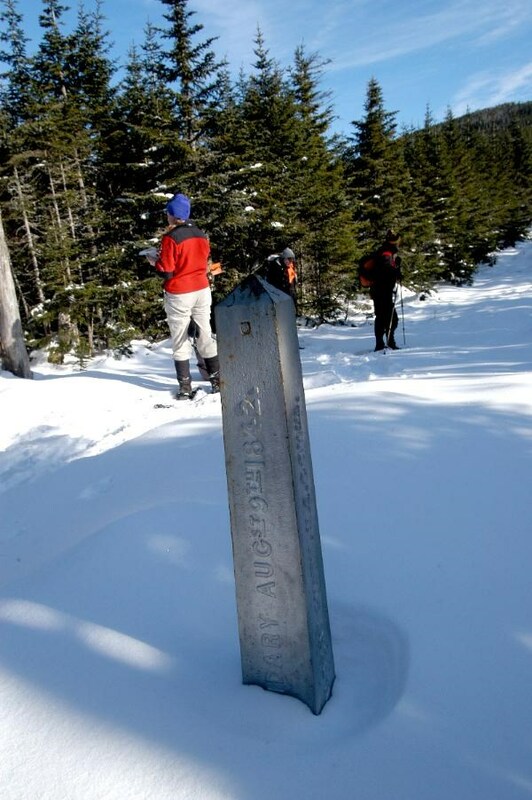 The one in Massachusetts set in 1825 to mark the boundary with New Hampshire seems to have been first used for geodetic purposes in 1912. The one in South Carolina, on the boundary with North Carolina, known as Commissioner's Rock, was visited in 1813 by Andrew Ellicott, who is among the most renowned surveyors in American history having laid out the boundary lines of several states during his illustrious career. Its location was observed using GPS during a joint ceremonial project conducted by surveyors from the surrounding states just a few years ago. So none of these would be considered among the oldest benchmarks, although they are marvelous old boundary corners. JU3343 is a fascinating read (marker type: earthenware jug). I bet there are other amusing ones in the list too. The blue marks are the 6 that Jeremy linked to, the rest are the others on his list. None of them are near to me, but some of you may have one in you area. I just don't know where I am. Many of the benchmarks in Jeremy's list are not found or otherwise not available according to the description. For now, I am focusing on all 95 benchmarks in his list. One entry was duplicated at the end. Remember that some of these are not found recoveries. Of the 8 benchmarks recovered since 2000, all are good recoveries and one was by an indivdual (MZ1504) but there is not an entry on geocaching for it. In an earlier message I guessed that the oldest true NGS point still in existence was probably from the 1830s... The other three are important historic points, but they are boundary points, appropriated rather than created by NGS. The one in Maryland set in 1765 was apparently first used by NGS in 1961. The one in Massachusetts set in 1825 to mark the boundary with New Hampshire seems to have been first used for geodetic purposes in 1912. The one in South Carolina, on the boundary with North Carolina, known as Commissioner's Rock, was visited in 1813 by Andrew Ellicott... So none of these would be considered among the oldest benchmarks, although they are marvelous old boundary corners. Sandy Hook Lighthouse was first lighted June 18, 1764. As a control point (horizontal), it was first observed (appropriated) in 1835 by CGS as KV4984 (Finial) and KV4987 (Light). By the standard above, it is only among the oldest, but, by placemant date (before appropriation) it predates the others in the list. When all else fails Geotry again. For history buff's, got to check out the old photo's and you thought your job was tough! I knew this area had some history... Today I found the Geocache "John Short 1754 Benchmark" by Ted. The cache was located near a colonial property boundary. The Marker had "John Short, 1754" inscribed into it. I may post pictures later. Here are pictures of the marker in King George VA.
Is this marker in the benchmark database? No...it is not in the database. The closest marker to this cache is 2.68 miles away. I thought it was a neat historical marker, though. What is the exact historic background of the marker, I assume it refers to the Colonial settlement and the original settlers. I am little behind on my early U.S. history but would love to hear it if you have something. I don't know any of the history yet . I plan to head back in the spring to check out the bald eagles, and I will see if the park has any more history on the marker. We found an old benchmark today dated 1906. Located at 43 16.005N 112 13.807W. Designation is X6and OY0219. Pictures are OY0219 and OY0219A. This may not seem old by East Coast standards but for Idaho, it is the oldest - by far - that we have found. Thats an especially good one all right. You may search for years without finding an older one of the disk or cap type. The oldest stamped marker I have ever found also dated from 1906 and I believe that may have been the first full year they used markers of that type, although they may have started using them on a limited basis earlier, so there may be some a few years older out there somewhere. This spire was not described until 1935, but the building was dedicated MAY 28, 1775! Looks to be the original steeple. EH2910 This Stone marks the Base Established November 10,1815,From which the Lands of the Louisiana Purchase were Surveyed by the United States Engineers. The first survey from this point was made to satisfy the claim of the soldiers of the war of 1812 with Land Bounties. We came across one looking for a cache the other day. Took picures, coords, dated 1952, & the only # that you could see on it. But we can't find it in the Benchmark list. It's our first BM find. Can anyone help? If you would post your question in a new thread and not as a not-on-topic message at the end of this long thread, you will get a better response. Also, provide the coordinates, what was stamped on the disk and pictures if possible. Otherwise, we have nothing to go on. It's been a while since this topic was discussed, but I came across an interesting stone that may qualify as the oldest benchmark. HU1686 is Boundary Monument EW 20 DE/MD. I have confirmed with the Delaware Geological Society that this stone was set in 1751/52 by the Transpeninsular Survey, as the 20-Mile (from the start of the DE/MD line at Fenwick Island, DE/Ocean City, MD) stone. The "mark" is the stone, itself, not a disk mounted in the top (like HU1800 and HU1443, for example). It was not "monumented" by NGS until 1974, however. The western terminus of the Transpeninsular Line was used by Mason and Dixon in or about 1764 as the starting point for their famous line. See HU1800. Plymouth Rock is not to far from here. Any Oregon Benchmark hunters out there? What are the oldest benchmarks in Oregon that still can be found? Use holograph's extreme stations website to find old stations to look for. the oldest benchmark in North Carolina is was set in 1849. Actually, Neweyess and I have recovered marks from 1813 and 1815 along the southern border of North Carolina. With the assistance of the State/County Boundary Specialist at NCGS, we are pouring over records of surveys done in the 1700's in the hope of finding evidence of our ancestors' work. It became obvious very quickly that it will not be bronze disks set in a 10-inch concrete..........excuse me.....what's that pile of rocks, next to the tree with a scar on the trunk? Though, I'd almost call it vandalism to drill a hole in a 65-year-old marble slab! The monuments in the Highlands portion of the Maine / Canada boundary were all set in 1843 - 1845. There all there to this day, easy to find. Here's one I've been to a couple of times: QH0376 "MON 445 IBC"
QG1360 - Moxie (Franklin county, Maine), Monumented 1902, no recorded recoveries. 103 years. QH0256 - Snow IBC (Franklin county, Maine), Monumented 1915, no recorded recoveries. 89 years. I've logged them both with the NGS. A lot of the oldest bm's are in New England. These are the bm's that I like to look for the best. Some of my old finds are. MZ1502 1832 FTF oldest in MA. Since this one I have found one 1877,and one 1892. Not the oldest here but it is for me.